winds 220/20 fog to start and broken wave thermal later. 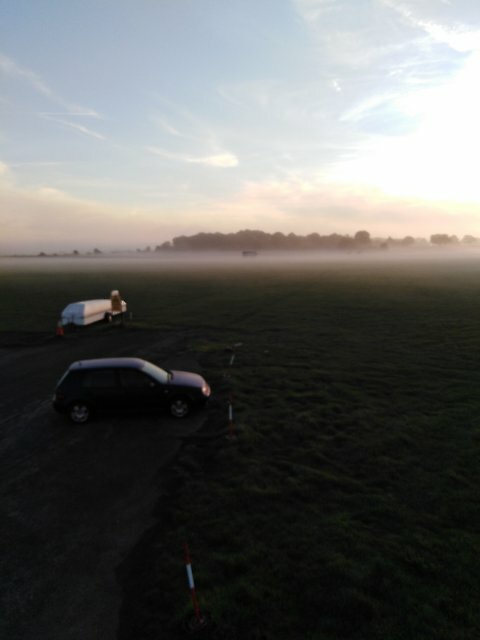 The fog lifted quickly and the course flying got underway promptly. Well done Matthew Veals for going solo. Charles Linton started his winch training with David, a good example to us all thanks Charles. Mr Janikowski used the launch facility to practice a few circuits in his discus before packing up his glider. The soaring wasnt quite as good as it looked. 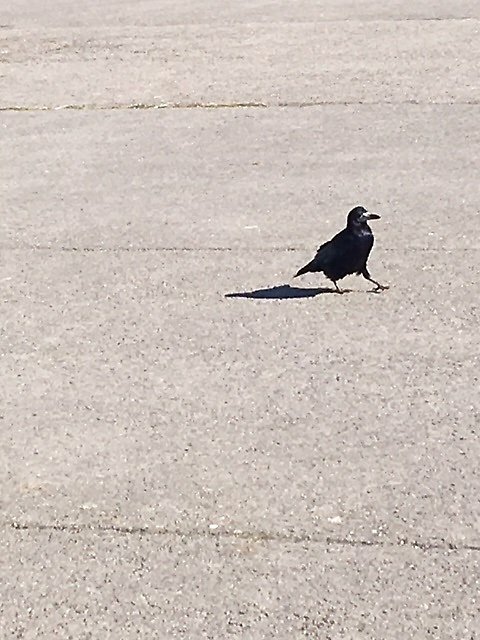 Gerald was spotted waiting for lunch at the winch, mind you we think it might be son of Gerald. Flyable tomorrow, but winds may be from the SE. Welcome to 4 course members. Marcus Williams, Matthew Veals, Pat Lyengar and Nigel Payne. A very busy course day that demanded an efficient turnaround to get everyone in the air. That was achieved so well done everyone, and particular thanks to our helpers, Colin Stringer, David Hart and Andy Davey for helping get the field set up and the team up to speed with the procedures. John McWilliam was seen disappearing in his PIK 20E, other than that it was all quiet on the club flying front. The outlook for Tuesday is much the same as today with slightly lighter winds. This is the penultimate course week of the year, so make sure you keep current and at least fly a circuit or two. More classroom work in the morning, followed by launch failure practice when the low cloud permitted. Richard spent some time fettling the buggies, while Tom Egan stayed at home nursing his twisted ankle. Welcome to our latest new member, Rex Lampier. 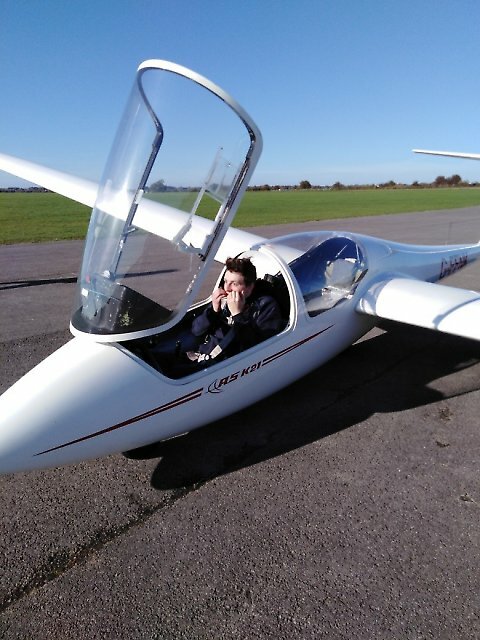 Rex has spent 2 weeks on courses and has decided gliding is for him, he is now solo and flying the ASK23. David Potter went solo today, well done to him. David is a member at Lasham and lives at Lee-on -the solent. Matt Page was spotted swinging from a pair of steps in the caravan park. He was , in fact , installing a new aerial for the WIFI, we now have a good working system. Thanks Matt, we are all very grateful. The end of another successful week, thanks to everyone for making it possible. The morning was spent in the classroom with lectures on Met and Altimetry. By midday it was flyable with weak wave tantalizing the pilots. Well done Mike Farmer for his first solo flights today, and to Dave Potter for his unprompted flights. Dave Howell and Colin Stringer joined us, thanks very much for all your help. The day ended with dinner at the old Lodge. On our return we met the cheery aero modellers, enjoying their meeting in the club bar. We hope for another good day tomorrow. winds forecast at 290/20. Some thermal activity during the afternoon. A really good day despite the less than inspiring forecast. Roger Bagley and Pat Greer kept the club flying going, while the course guys spent the day in the K13 doing various spinning exercises. Rex Lampier did his personal best soaring flight of a little under the hour. Grass cutting around the caravan park thanks to David Hart and the South field thanks to Andy Smart. 2 self launchers went off at the end of the day to explore the wave at the Malverns. winds 290/20 cloud bases around 1400ft QFE. 2 club single seaters and the K21 out today, operating on 27. The farmers bales are now gone, so no obstructions on the field now. The course team managed an extremely crisp launch rate and so everyone managed plenty of training flights. Rex is now flying the K23, while Colin Stringer kept current with the ASW19. The course guys practised launch failures, too fast signals, various stalling exercises and circuit planning---great progress being made. NW winds and good soaring from around 12 noon. Welcome to Mike Farmer, Rex Lampier and David Potter. Rex resoloed and Mike and David worked omn launch failures. Thanks to David Hart and Colin Stringer for their help at the launchpoint. What a beautiful day; blue skies, little wind and for a few hours there were thermals to 2500'. Instructors were kept busy with the one-day-course and a few UWE students flying K21 and K13. Our vintage fleet was represented by the Skylark 2 (Mk4) and ETPS Oly 2b, both of which soared nicely. A few more modern private owners kept the launch point busy as well and we even saw the DG400 take a wire launch instead of using his pop up motor. Thanks to duty winch drivers, log keepers and helpers for making the day run smoothly. What a wonderful day. 100% turnout from red team, four club gliders at the launchpoint by 10 am. Clear blue skies and a light wind brought some thermals by lunchtime and a few private owners brought out a variety of aircraft for some local soaring, including Adrian and Frank with their 1957 Skylark and Robin's even older Oly. 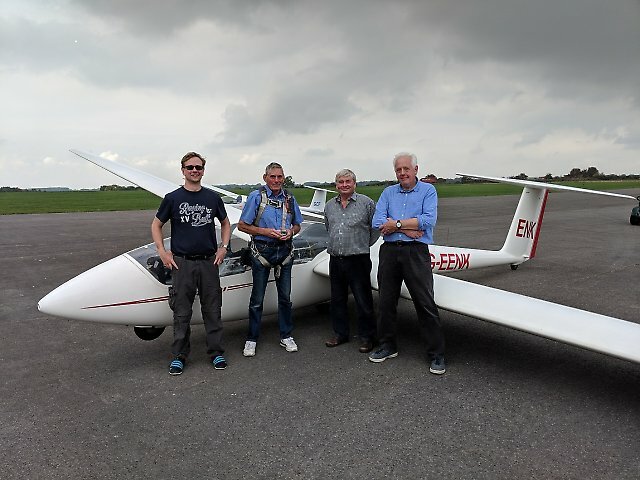 Finally former UWE student Dan Van de Werf unpacked his shiny new Cirrus for his first couple of flights. Thanks to the superior winching skills of the chairman and help from David Hart and Colin Stringer several pilots had three hours each in the air today. Fran's contact details will follow.